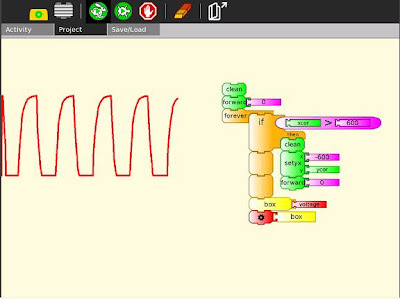 Turtle Blocks is an activity with a Logo-inspired graphical "turtle" that draws colorful art based on snap-together visual programming elements. Its "low floor" provides an easy entry point for beginners. It also has "high ceiling" programming features which will challenge the more adventurous student. For those of you who would like to use Turtle Blocks in a browser, there is a mostly compatible version at Turtle Blocks JS. See the Guide (en ES) for more details. Finally, there is Music Blocks, a musical fork of Turtle Blocks. See the Guide for more details. You add blocks to your program by clicking on or dragging them from the palette to the main area. You can delete a block by dragging it back onto the palette. Click anywhere on a "stack" of blocks to start executing that stack or by clicking in the Rabbit (fast) , Turtle (slow) or Bug (debug) buttons on the Project Toolbar. When a new named stack is created, a new action block is added to the palette. Box names (and stack names) can be boxes, in this case (taken from the math-dice project), a one-dimensional array of 11 variables has been created. Gary Stager has some more Turtle Art cards here. The run buttons are tied to the Start Block. If no Start Block is used, then all blocks are run when either run button is clicked. The "rabbit" button runs the blocks at maximum speed. The "snail" button pauses and displays the turtle and block values between each step. The button, which is replaced by the Stop button on the main toolbar while the program is executing, is used to reveal the program blocks. Individual palettes can be hidden by clicking on their highlighted tab. To share a stack, click on the share button. The cursor will change to the hand shape . Place the cursor on any block or stack of blocks and click. The blocks will be shared and the cursor will change back to the arrow shape. The Edit toolbar is used to copy stacks of blocks to the clipboard and to paste stacks from the clipboard. To copy a stack, click on the copy button or type Ctrl-c. The cursor will change to the hand shape . Place the cursor on any block or stack of blocks and click. The blocks will be copied to the Sugar clipboard and the cursor will change back to the arrow shape. To paste from the clipboard, type Ctrl-v or click the paste button. Additional palettes may be loaded by plugin extensions to Turtle Blocks. A custom palette is created if you use the 'save stack' button on the Edit toolbar. The palettes can be displayed horizontally or vertically (See below). Orientation is adjusted by clicking on the and buttons on the upper-left corner of the palette. The palette can be hidden by clicking on the button on the lower-right corner of the palette. The next palette in the menu can be accessed by clicking on the button on the upper-right corner of the palette. On smaller screens, a palette may not fit. It can be scrolled by clicking on the button. These blocks are used to control the attributes of the turtle's pen. Note: When a named action or named box block are used, new blocks appear on the palette that correspond to these names; e.g., if a top of action stack is rename, "to square", an action block, "to square" is added to the palette. Palette with additional actions and boxes created by the user. See Activities/Turtle Art/Using Turtle Art Sensors for more details about the sensor blocks. turtle shell: import a image from the Journal to use as the turtle's 'shell', i.e., replace the turtle with a sprite. The custom palette holds any blocks that have been saved with "Save Stack" option in Edit Toolbar. It lets you reuse stacks between projects. Blocks on this palette will expand into action stacks. This palette first appears after using the "Save stack" option on the Edit Toolbar. Note for OLPC-XO laptop users: the buttons on the display can also be used. Did you know that you can copy/paste stacks to/from the clipboard? You type Ctrl-C to copy whatever stack is under the cursor to the clipboard. Ctrl-V will paste from the clipboard onto whatever TA project you have open. Try pasting this code into your Turtle Art project. You can also paste text from the clipboard into text blocks. Note: You can duplicate individual blocks with copy and paste, when duplicating a text block, deselect the text block after copying if you want to duplicate the block rather than duplicating the text within the block. The 'rabbit' button will run your program at full screen. Note: It will highlight blocks during execution, so your program will run much faster if you hide blocks. The 'turtle' button will run your program with a slight delay between blocks. Block are highlighted as they are executed and block labels are updated with the current block values. The 'debug' button will run your program with a longer delay between blocks. Block are highlighted as they are executed and block labels are updated with the current block values. Turtle Art supports a simple sharing model. Whomever joins a shared activity will share turtles with the other participants, e.g., whatever any turtle draws will appear on every screen. While sharing, you can also send stacks of blocks from one user to another. Share can consume a lot of network bandwidth, so it is not recommended to share among more than 2–3 people at a time if the screen is frequently changing. As with all Sugar activities, you can use the Share-with feature of the Journal to share your Turtle Art projects with others. A simple application of Turle Art sharing is multimedia chat. Send text using the Show Block; voice using the Speak Block; and images using the Show Block. Lots of fun. Note: Turtle Art will also share between Sugar and GNOME. This (yellow) turtle drew a green star. This (blue) turtle drew a blue square. This (red) turtle drew a red circle. A simple script to broadcast video by sharing. Turtle Art can be run in the GNOME desktop outside of Sugar. The XO1.5 and later software builds for the XO1.0 allow switching between Gnome and Sugar desktops. The following assumes that Turtle Art is already installed in Sugar. Turtle Art comes with many sample project. Below are additional examples created by community members. An bringing it all together, the Turtle Art Oscilloscope. Tony has also used the programmable block to do file IO. I know there are a few but they are not categorized on this page... we'll make that happen soon. Help would be appreciated. Get your hot cold Turtle Art Video here! A list of further video clips can be found here. Mokurai has been working on how to teach Sugar by guided discovery, rather than by explicit direction, with only the necessary minimum of hints. At the same time, he has been working on Turtle Art examples to teach concepts of mathematics, programming, Computer Science, and physics, aiming where possible at presentations suitable for pre-literate pre-schoolers. Thus, no text, no formulas, no calculations. Those can come later in sequences on the same topics as children develop, including a transition from Turtle Art to Python, Logo, and Smalltalk, with options for other languages. However, it is necessary to provide texts, sometimes with formulas and calculations, for the teacher or parent helping the child. These will appear on Mokurai's Replacing Textbooks blog, available at PlanetSugarlabs, and will be incorporated into Open Education Resources on the Sugar Labs Replacing Textbooks server. At this level it is not necessary to use Turtle Art_to_introduce ideas. Nevertheless the ability to display a topic in Turtle Art demonstrates that it is of only a moderate level of complexity. Play with Turtle Art to draw colorful art patterns using a turtle that accepts instructions for movement. With visual programming blocks, you can snap together programs by compiling (combining) them in ways to create anything you can imagine. Tony Forster describes his "adventures" with on-the-fly definitions to create an analog clock in his blog. Q: How do I cast keyboard input to a string? A: Use chr(). In the era of high-stakes testing, we have the means to measure “which child knows more”; these data tell us about relative merit of the school in which a child is enrolled. The Turtle Art portfolio feature is an assessment tool that shows “what a child knows”; children become the curators of their own work. They advance their own learning and help their teachers, parents, and school administrators understand better the depth and breadth of what they have learned. ePortfolios offer colleges a meaningful mechanism for accessing and organizing the evidence of student learning. Turtle Art portfolios engage children in the process of reflecting on their work—what they have done, how they have done it, and how success these efforts have been—as they create a multimedia narrative to show their teachers, parents and peers what they have learned. Turtle Art Portfolio builds upon the journaling functionality of the Sugar learning platform, where every action or activity a child takes in the classroom is automatically recorded in a folder: (1) by enabling the child to select important learning achievements, be they in reading, writing, arithmetic, arts, music, physical education, history and social science, etc. Children answer questions such as “I chose this piece because...” (2) creating a multimedia narrative presentation from their selections (including audio voice-overs and video), reflective of the multiple ways in which children learn; and (3) sharing their presentation with classmates, both to celebrate what they have learned, but also to engage in a critical dialog about their work. Turtle Art portfolio is innovative in three ways: (1) it builds upon a journal of *all* learning activities that is automatically collected; (2) it has unique programmability, fun and accessible to even the youngest elementary school children, but interesting and engaging to middle-school children as well; and (3) it has unique tools for both collaborating on the construction of the portfolio and its subsequent sharing with others. Portfolios have been shown to be “a powerful means for children to assess their own work, set goals, and take responsibility for their future learning.” But portfolio assessment has seen limited applicability. It is a practical, engaging means to using portfolios. By building upon the automatic accumulation of work in journal (including a “screen capture” of their work) the portfolio process can readily be integrated into the classroom routine. Reflection becomes the norm: children are encouraged write in their journals (young children record audio notes) for a few minutes after *every* class. The numbing question, “what did you do in school today?” need no longer a necessary part of the parent-child dialog. Instead, the parent can talk to the child about actual artifacts. Culling from the journal becomes part of the end-of-term assessment process. The process of telling one's story as a learning requires further reflection. At a “portfolio social”, parents are invited to view presentations and ask children about their learning; the child's voice is heard. The classroom teacher can add addition assessment slides to the portfolio about themes such as work habits and personal growth, as part of an archive that travels with a child across grade levels. Through juxtaposition, the child and teacher can see what has changed over the course of the years, trends, and areas for improvement, Also, a classroom portfolio can be assembled as part of a teacher-assessment process. From version 106, pen trails, fill, show text and show images are shared with other laptops in a shared session. Screen erase is not shared. A slideshow can be broadcast to other laptops. Its simple, just these 2 blocks are required to broadcast a slide to all the laptops in the shared session. Use set scale to set image size. Full screen images take longer than smaller images. See below for using the keyboard to advance slides and other presentation ideas. Start by selecting a slide template from the palette. The templates will automatically expand into a stack. Click on the Journal icon to initiate a search for slide content. Select a journal object, such as an image, audio file, movie, or activity. A thumbnail will appear in the template. The description field for the Journal object will automatically be loaded. Once loaded, the slide stack can be labeled and collapsed. Try using some of the other templates. View them by clicking on them (you may want to use the Eraser button first). You can program a simple slide show by making a stack: fullscreen; hide blocks; clear the screen; show Slide 1; wait; clear the screen; show Slide 2; wait; show blocks. You can also program stacks for your slide decorations and slide transitions. In this example, we draw a rule under the title of each slide. Run your slide show by clicking on the Run Button on the Main toolbar. In this example, we use keyboard input to transition between slides. Using the f and b keys to advance or go back slides. A video of the portfolio basics is available here. A PDF of a Turtle Art portfolio presentation can be downloaded File:Desktop-Summit.pdf. Turtle Art can export its projects to Berkeley Logo (using either View Source or the Save as Logo button on the Project Toolbar) You can download the Berkeley Logo activity here. Logo code generated from your project is viewable in the View Source panel in some versions of Turtle Art, but as of v100, the Turtle Art project itself is shown instead. Note: The Save-as-Logo button saves to the Journal as "logosession.lg". UCB Logo does not yet access the Journal directly, so it is necessary to copy the project out of the Journal using the "copy-from-journal" command in the Terminal Activity and then accessing the project using the File menu within the UCB Logo Activity. Alternatively, you can open the logosession in 'Write', copy the Logo code to the clipboard, and then paste it into the UCB Logo Activity. Shown here is the Logo code generated from the Turtle Art project shown above. The following feature—a block that can be programmed by the Pippy activity—is available in versions 44+ of Turtle Art. You can edit the tamyblock.py module in Pippy. Then load the Python code into the Python block using the Pippy button on the Project toolbar. You can only have one type of Python block in your Turtle Art program. Another way to load the Python block, is to click the Python code block found on the the Extras palette. You can't run a Python block by clicking on it, as that opens the object selector; instead attach the block to another one and click elsewhere on the stack you have created. You can pass a list of up to three arguments to tamyblock.py as in the example below that converts the input to an rgb value. # Push an uppercase version of a string onto the heap. # Use a 'pop' block to use the new string. # Push hours, minutes, seconds onto the FILO. # Use three 'pop' blocks to retrieve these values. # the first value you will pop will be seconds. # Add a third dimension (gray) to the color model. # Save an image named x to the Sugar Journal. This Python block returns with the brightness sensor value in the heap. A range of parameters can be measured, for example, substitute any of the path strings in the table for the 'device' in the program below. Look in /sys/devices on your computer to find other devices you may be able to access. the Python code block supports multi-line code. The Python function block is processed through tajail.py. For security reasons, it cannot access Turtle Art objects. It can it only access the Python language and the time and math libraries as the following extract from tajail.py shows. Turtle Art is created in object oriented Python code. This is based around the definition of classes and the creation of object(s) which are instance(s) of that class. These objects then have properties and methods which are defined by their class. See http://docs.python.org/tutorial/classes.html for a description of classes in Python. setpen(self, flag) lc.tw.canvas.setpen(True) True will set the pen "down", enabling drawing; False will set the pen "up"
As of Version 106, there is plugin support for Turtle Art. The basic idea is to let developers add new palettes and blocks to support additional functionality without having to make changes to any of the core Turtle Art packages. If a plugin is present, it is loaded when Turtle Art is launched and any palettes or blocks defined by the plugin are made available to the user. The plugin mechanism is currently used to provide support for sensors, the camera, RFID, and the Media, Extras, and Portfolio palettes. A plugin has been developed for WeDo (and here) and additional plugins are being developed for Arduino, NXT, and GoGo. NOTE: As of Version 193, it is necessary to use a set of refactored plugins. These will be posted to the wiki ASAP. Plugins are typically distributed as a *.tar.gz archive. Download the plugin to your Sugar Journal, a USB key, or $HOME/Documents. Click on the 'Load plugin' button found on the Activity toolbar. Select the plugin downloaded in Step 1. Go to the Palette toolbar to confirm that the plugin has installed and loaded properly. Note that you should not need root access to install plugins into your home directory. Xevents it's a plugin for make accesibility interfaces in an easy way. Butiá is also featured in a short film by Antel  (go to 1:30). The "classic" use: on "Start", use the "Calibrate" block to open a window that shows the camera output. In the center of that window there is red square. The FollowMe Plugin uses an algorithm that obtains the "promedial" color of the object in the square. The result of that algorithm is shown in a small square in the corner. When you consider that the color is a good "representation of the object", press any key, the window will close, and FollowMe will use this color. After calibration, you can use the "X position" and "Y position" blocks. The block "X position" is the "center" of the object seen by the camera along the "X" (horizontal) axis. This value is an integer between 0 and 320. When the object is not detected,the algorithm returns -1. The operation of the "Y position" block are the same, but returns the position respect the "Y" (vertical) axis. The value returned is between 0 and 240. When you know the color to "follow" (it occurs rarely, since the color varies under changing light conditions) you can use the "Follow RGB" block. This block sets the color directly to the algorithm. In all cases, the color has a threshold of 25 in each component set by default. With the "Threshold" block this value can be changed. The third option, is to use the "FollowMe" block that "follows" a generic color similar to that shown. Add a palette to enable pattern detection with the camera. This palette adds blocks to detect ARToolkit patterns and the distance to them. This plugin is an ARToolkit wrapper, and comes with several traffic signals already configured. Here are some samples and videos on how to use the palette blocks. Tony Forster created a WeDo plugin based on the work of I.T. Daniher. Alan Aguiar has also helped with the plugin. The source code repository is available here: . File:Wedo plugin 2.tar.gz Version 2, which supports multiple WeDo devices. Note: Check out https://github.com/itdaniher/WeDoMore/tree/master/udev for instructions on how to setup the proper permissions talk to the device. In the new versions of Sugar the udev is included. This is a first pass at a plugin for the ExpEyes Junior. For more info, see . The Arduino is an inexpensive single board computer which can be controlled by Turtle Art and used for robotics experiments. The XO-4 touchscreen laptop comes with two unpopulated circuit boards, the XOstick and the XOrduino. There are several efforts to develop Turtle Art support for Arduino. It requires the Firmata protocol to be uploaded to the Arduino board. (see here) Use the latest Firmata version (2.1 as of now) downloaded from the Firmata page (firmata.org) The Firmata version included with the Arduino IDE has some inconsistencies. This version has english and spanish translations. The plugin file can be downloaded from arduino_plugin.tar.gz. This is just a first rough pass at a plugin do calculations on the nutritional value of different food types. The plugin itself comes with some sample foods: apples, bananas, cookies, and cake. It is expected that the food choices will be customized by deployment. See https://www.choosemyplate.gov/SuperTracker/ for nutritional values (calories, protein, carbohydrates, fiber, and fat) of different foods. Note: The current model is cleared whenever the Erase button is pressed or a Clean block is run. This plugin provides logical bit operations in Turtle Art, such as AND, OR, XOR, NOT, logical shift left, logical shift right. The math plugin allows to use advanced mathematical functions in your program. Also, this version include Translate plugin. (File:Turtleblocks-167.1.xo is the Alpha version of Turtle Art for GTK3. It requires GTK3 and GST1 (both available in Sugar 0.98 on OLPC 13.1.0 builds) This version includes the Facebook plugin. Your plugin should be placed in a subdirectory of the plugins directory. In that subdirectory, you need to create a .py file that defines a subclass of the Plugin class. The directory and .py file must have the same name and the subclass must also have the same name, with the additional requirement that the first letter of the class name be capitalized. In that subdirectory, you will also need a __init__.py file (which can be empty) and optionally, an icon subdirectory for your palette icon. For example, if we want to add a new turtle command, 'uturn', we'd use the add_block method in the Palette class. # case, the canvas function to set the heading. That's it. When you next run Turtle Art, you will have a 'uturn' block on the 'mypalette' palette. As of Turtle Art v137, there is a built-in mechanism for installing plugins. Please include a plugin.info file in the top level of your tar.gz bundle. Other fields, such as version, license, etc. may be used in the future. Turtle Art is a Fructose module, so it is included as part of the standard Sugar (Sucrose = Glucose+Fructose) distribution. Turtle Art was written by Brian Silverman and is maintained by Walter Bender. Arjun Sarwal added the sensor features. Luis Michelena contributed to the "named" action and box blocks. Tony Forster has been the lead test engineer and has really stretched the boundaries of Turtle Art. Raúl Gutiérrez Segalés has been a major contributor to the refactoring of the Turtle Art code base starting with Version 0.83. Club ¡Formando Artistas con la Tortuga! Capacitacion y seguimiento de Formadores para el acceso a la XO!! Turtle Art projects are stored as a .ta file contains a json-encoded serialization of the project. This page was last edited on 17 October 2015, at 10:45.